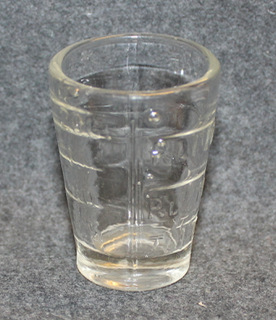 Original Finnish Medicin measures, made of glass. Most likely manufacturer is Iittala of Finland. Used, possibly thousands of times, some scratches may be visible on surfaces, very good condition, some have no visible wear, the older versions are made of glass that has lots of air bubbles in it. We got these from the medical supply depot auction, so these are possibly army issued. Large size height: 48mm, diameter 35/51mm OUT OF STOCK! Size and color have little variation. Collar tabs, medical corps. Finland.